One can debate many strategies in football. But there is one thing no football coach will ever doubt: the importance of counter-attacking. In football, goals can either be scored from a positional attack, from set-piece situations or from counter-attacks. The latter contains some advantages one can benefit from which will be outlined in the following article. In this analysis, we will take a closer look at different counter-attacking concepts. The aim is to reveal the different advantages and disadvantages as well as how the concepts correlate with different types of players. Why is counter-attacking so successful? Football is always about space. The more space one gets in possession, the higher the chances of scoring. This is what counter-attacks benefit from. If a team that is providing full width and depth loses the ball, it misses compactness. Players will have more time on the ball, which increases the probability of correct decision-making. Football players act differently in and out of possession. That means right after losing possession every player needs to transition from attacking behaviour to defending. In the situation below, you can see RB Leipzig winning the ball against Mainz 05. Whereas Leipzig are ready to counter-attack, Mainz deploy a wide structure and thereby offer space in the centre. As a result, Leipzig score through a fast counter-attack. One striker presses, the other one is ready to transition to attack. Leipzig thereby make use of the given space in a counter-attack after regaining the ball. Since the time to penalise the opposition disorganisation in counter-attacks is limited, quick decision-making is important. 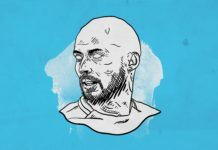 Whereas in counter-pressing former Ajax coach Peter Bosz spoke about the “five-second rule”, there are several opinions on the time window in which a counter-attack should be finished. However, one can claim that finishing a counter within five to eight seconds after winning the ball (depending on the level) will prevent the opponent from regaining their defensive shape. As football is a game with a lot of changes in possession, attack and defence cannot be divided. This leads us to the assumption that one needs to defend during the attack and attack during the defensive phase. That means that the correct defensive positioning can also be an advantage when winning the ball. The press already prepares for the following attack. The area where the ball is won determines the distance to the opposition goal as well as how much space is offered. Depending on the strengths of your team and the weaknesses of the opponent, different pressing systems can be more or less useful to prepare the counter-attack. The high press creates a short distance to the opposition goal but offers only a little space behind the last line of defence. Firstly, it is possible to press the opponent high up the pitch. On the one hand, this shortens the distance to the opposition goal. On the other hand, this strategy offers less space behind the last line of defence. In the situation below, Liverpool can score after regaining possession high up the pitch. As the Liverpool player intercepts a pass, only two defenders are positioned between goal and ball. Liverpool press high and intercept a pass in the opposition half. Therefore, highly dominant teams that are able to dominate in possession use the high press. The players are capable of combining in tight spaces and do not need much space behind the back line. 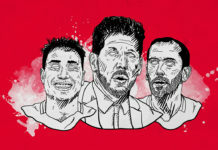 For instance the Premier league’s two dominant sides, Manchester City and Liverpool, press high up the pitch and quickly counter-attack if possible. The low press creates a big distance to the opposition goal. On the other hand, there is a lot of space behind the last line which can be exploited in a counter-attack. In contrast to the high press, teams can sit back in a low block. This strategy obviously increases the distance to the opposition goal. Nevertheless, it also offers much more space behind the opposition last line. Therefore, this concept is predestined for sides with fast attackers. Low defending is mostly rather passive and thereby less guided into certain areas of the pitch. There are exceptions like Atlético Madrid that defend low but actively press the opponent in certain areas. Atlético Madrid make use of the available space in a counter-attack after defending in a low block. Atlético like to make use of the given space behind the back line in counter-attacks like in the picture above. To successfully counter-attack that way, it is important to have enough players moving up the pitch to support the attack. The mid-press creates some space behind the last line, whereas the distance to the opposition goal does not increase too much. The mid-press creates space behind the last line while the distance to the goal is not as great as in a low press. The mid-press can be used to create more space behind the opposition back line compared to the high press. Another possible reason why a mid-press might be useful is the decreased space behind a team’s own defensive line. If your own defenders are not fast enough to keep pace with the opposition strikers, it would be very risky to use forechecking. Liverpool regain possession in a mid-press against Manchester City. 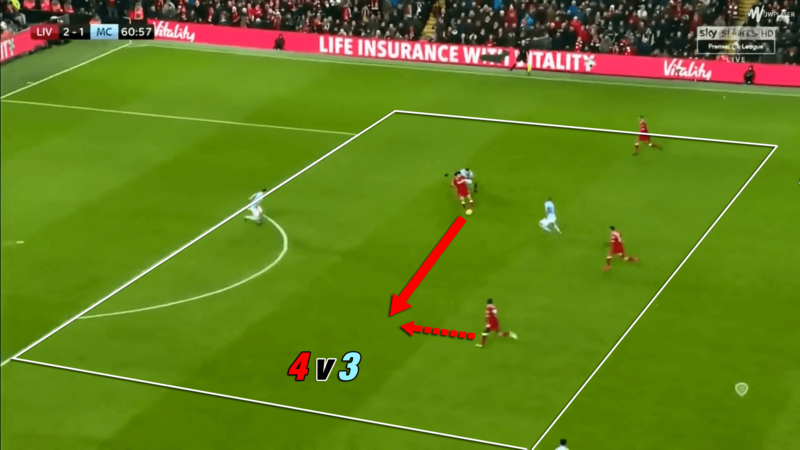 Liverpool for instance also used a mid-press to beat Manchester City in the Premier League. This prevented Liverpool to be pinned down in their own half. 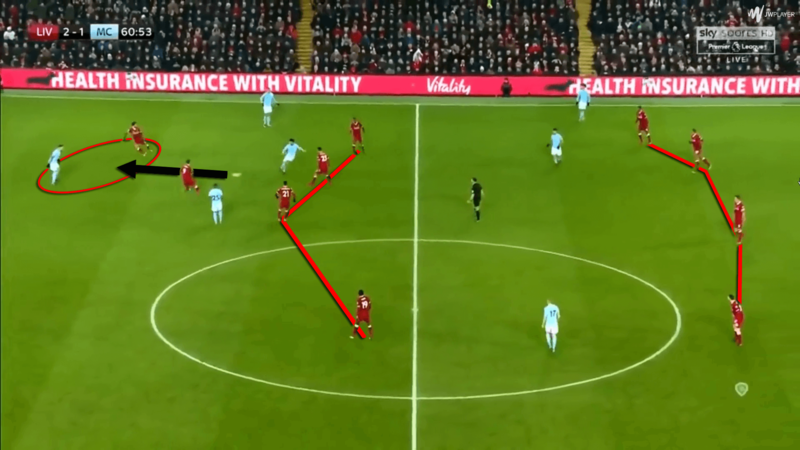 Moreover, it allowed the pacy attacking trio of Mohamed Salah, Sadio Mané and Roberto Firmino to make use of the available space in Manchester City’s half. 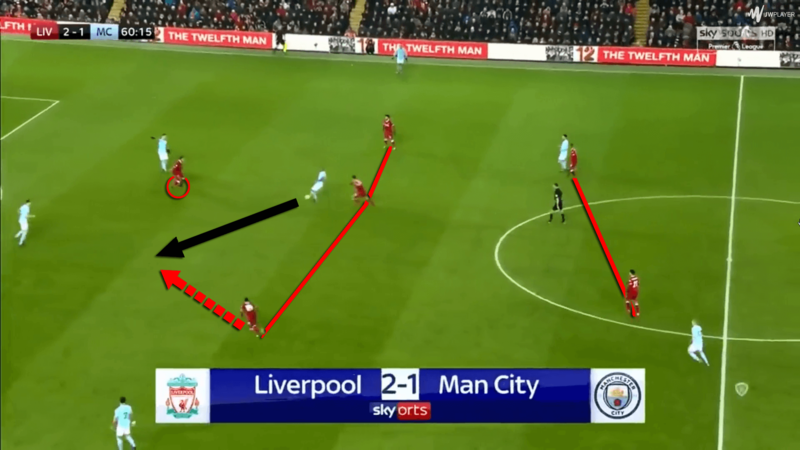 With this strategy, Liverpool were able to outnumber City’s defence close to goal. As with a low block, it is also necessary to have enough midfielders supporting the attack after regaining possession. For a successful press, it is useful to guide the opposition into certain areas of the pitch. Dividing the pitch into the centre, half-spaces and wings, these areas also bring advantages and disadvantages such as the height of the press. 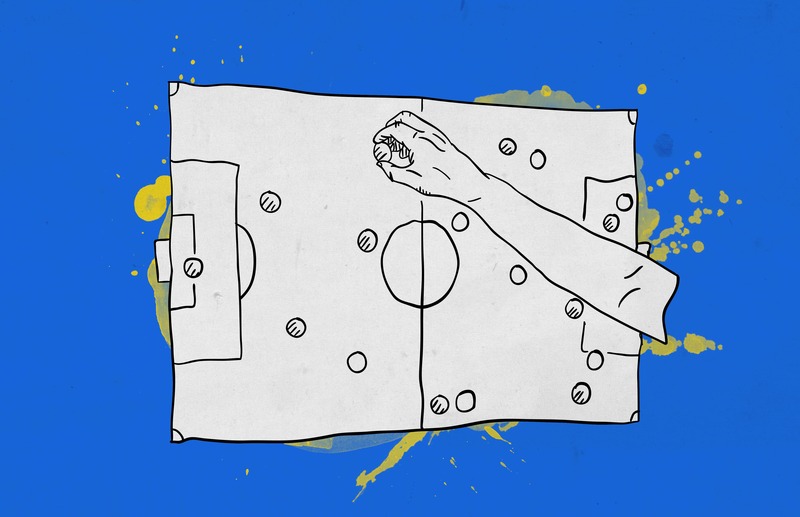 While it is easier to press on the wing because the options are limited through the touchline, pressing in the centre is far harder since the opposition can play into every direction which means that more passing options need to be shut down. Nevertheless, the distance to the opposition goal plays an important role as well. The more central the press, the shorter the distance to the opposition goal. Furthermore, it makes sense to adjust one’s strategy to fit one’s own formation, and that of the opposition. If the opposition, for instance, plays with only two central midfielders in a 4-4-2 and your team sets up in a 4-1-2-1-2 (diamond midfield) with four central midfielders, it is useful to guide the opponent into central areas. Keep in mind to always create numerical advantage near the ball or lead the ball to where your team has numerical advantage. As counter-attacking appears during a transition phase, quick reaction and thinking as well as a high speed of play is required. Therefore, it is useful to encourage your players to take risks. As most team mates are still positioned between goal and the ball, the risk during a counter-attack is relatively low while the chance of scoring is comparably high. Due to this, counter-attacks should allow players to take risks. Counter-attacking plays an important role in football, no matter what style of play your team prefers. Counter-attacking opportunities occur for every side of the world. 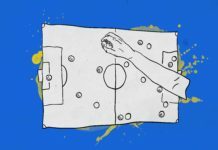 As the advantages of the transition phase from defence to attack are bigger than in any other phase, every team needs to make use of them in order to be successful. Santiago Arzamendia: Paraguay’s Future Flying Full Back?